John Maybank, Ex Sub. Lieut. (A) RNZNVR, 1830* (FFS) HMS Illustrious; 1834* (FFS) HMS Victorious. At the end of the Second World War, the British Pacific Fleet was actively engaged in one of the bloodiest battles of the Pacific War. This article has been expanded from a report to the Fleet Air Arm Officers’ Association on the laying of a wreath at Okinawa in February 2014. The Battle of Okinawa, nicknamed Typhoon of Steel in Japanese and codenamed Operation Iceberg, was the only land battle fought on Japanese soil during the Second World War. The battle lasted three months from 26 March until 23 June 1945and the fierce fighting resulted in nearly a quarter of a million deaths. The land forces consisted of four divisions of the US Army and two of US Marines, supported by the largest amphibious assault of the Pacific War. Okinawa is the largest of the Okinawa and Ryukyu Islands, which lie some 350-400 miles south of the main islands of Japan. The plan was for an amphibious attack on the island with the objective of securing the airports for use as an air base for operations against the principal Japanese Islandsto the north. The planned invasion of Japan was codenamed Operation Downfall and the occupation of Okinawa was seen as the first step in ending the war in the Pacific. The British Pacific Fleet, under Admiral Sir Bernard Rawlings, provided four aircraft carriers, two battleships, five cruisers and 14 destroyers in support of the United States Fleet. The British contingent was designated Task Force 57 (later 37) and was responsible for the operations known as Iceberg 1 and Iceberg 2. These took place overthe Sakashima Gunto Islands, south west of Okinawa, with the objective of preventing Japanese air activity and kamikaze attacks on the southern flank.Both theislands of Sakashlma and Miyako had fairly large airfields and these had to be put out of useand kept out of use. Formosa (now Taiwan) was also in Japanese hands and had many airfields. There was fierce opposition on land and, during the battle, the allies lost 14,000 men, with a further 50,000 wounded. The Japanese lost some 77,000 soldiers and around 150,000 civilians. Many Japanese soldiers committed suicide and large numbers of civilians were forced to commit mass suicide by the Japanese army. Many more died of starvation or disease. The implication of the Japanese army in the civilian suicides, in the starvation resulting from the sequestration of food and in the use of the civilian population as human shields is still a highly contentious issue today, with central government preferring to rewrite history and the Okinawans wanting the horrors to be known in the hope that they will never be repeated. Ninety per cent of the buildings on Okinawa were destroyed during the three months of the battle. The influence that the ferocity of the defence of Okinawa had on the subsequent allied tactics in the Far East will probably never be known. However, the Japanese surrender following the atomic bombing of Hiroshima and Nagasaki, came just two months later. With this surrender, Operation Downfall was cancelled. The Battle of Okinawa was the bloodiest battle of the Pacific War and the events are now commemorated in Japanese Peace Parks and Peace Museums. The Peace Park at Mabuni contains the Okinawa Prefectural Peace Memorial Museum and the ‘Cornerstone of Peace’ monument, whichrecords the names of 240,931 people who died in the Battle of Okinawa between 26 March and 2 September 1945. These include 149,193 Okinawa civilians (40,000 of whom had been drafted by the Japanese Army); 77,166 Imperial Japanese soldiers; 14,009 US troops; 365 South Koreans; 82 North Koreans; 82 British; and 34 Taiwanese. Following their defeat in the Philippines, the Japanese High Command realisedthat bombing ships from the air was not achieving results, so they decided to use their manned aircraft as guided bombs. This strategy wasagreed by the Emperor and the order came into force in October 1944. It wascalled The Divine Wind or Kamikaze and pilots were selected from both Army and Navy units. Many volunteered, but university students were also conscripted and assigned to this rôle. In the American Fleet, out of 525 fighting vessels, 22 weresunk and 254 damaged. The US Fleet lost 539 aircraft, the British 150. US personnel casualties were 4,907 killed and missing and 4,824 wounded. TheBritish lost 82 killed and 83 wounded. No British ships were lost, but all fourcarriers were hit and HMS Illustrious was so damaged that she was forced to returnto the UK for major repairs. Five British Fleet Carriers were involved in the Iceberg 1 and 2 operations: HMS Indefatigable (Rear Admiral Philip Vian, Flag Officer Commanding Aircraft Carriers), Illustrious, Victorious and Indomitable. HMS Formidable replaced HMS Illustrious on 26 April 1945 at Leyte Gulf. On 4 May 1945, from the quarterdeck of HMS Victorious, I witnessed an attack on HMS Formidable, when a Japanese kamikaze dived from about 2,000 feet, firing his guns as he swept along the flight deck. As he flew over thebows he pulled up into a loop and, at the top, simply flicked the plane into adive, straight into the deck. There was a violent plume of flame and black smokewhich shrouded the ship, then she broke away trailing smoke. Within an hour or so, she was back in service,landing-on her aircraft, including a flight of four Corsairs that had taken refuge with us. Six men were killed and 47 wounded. 11 aircraft were destroyed. Japan lost nearly 4,000 kamikaze pilots during the war in the Pacific and about 20% of these managed to hit a ship. The principal airbase for kamikaze missions during the Battle of Okinawa was the Imperial Japanese Army base at Chiran, Kagoshima. 40% of the pilots who died in these attacks were from Chiran and more than 75% of these were classified as ‘young boy pilots’. The Chiran army base is now the site of the Chiran Peace Museum for Kamikaze Pilots. 2014 saw the 100th Anniversary of the outbreak of the First World War and the 75th Anniversary of the outbreak of the Second World War. Every year that passes sees the anniversary of individual actions and, as time moves on, there are fewer and fewer veterans left who actually took part in these actions. Thus, although the 69th Anniversary of the Battle of Okinawa in 2014 is not associated with a round number, it was nevertheless an immense privilege to be able to visit the Okinawa Memorial and lay a wreath on behalf of the Fleet Air Arm Officers’ Association and the Fly Navy Heritage Trust, representing all the other Fleet Air Arm Associations. This was a poignant moment as I knew, well, seven of the 82 names recorded on the British Pacific Fleet panel. 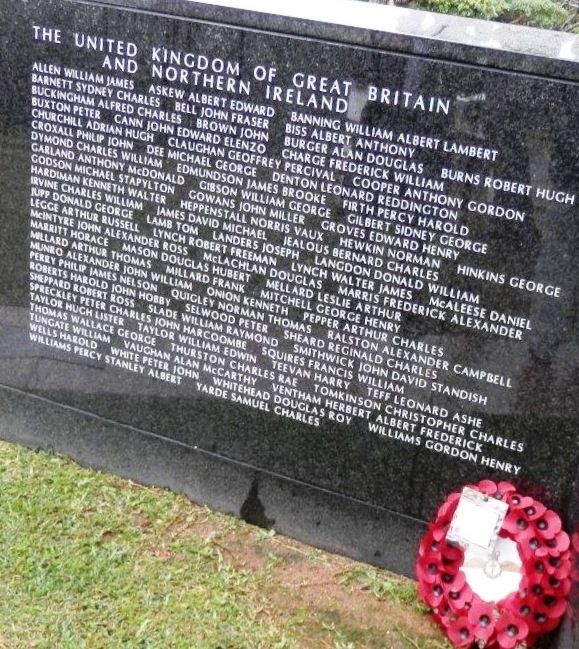 The names are simply engraved with surname followed by given names – no ranks, ships’ names or anything else – just the names of those who had died. Moments after our little ceremony, we were visited by a photographer who mentioned that, as I was laying the wreath, the new US Ambassador to Japan, Caroline Kennedy, had parted from her entourage and had walked to within 20 feet or so in order to watch us. The daughter of President John Kennedy, to me, she represented the United States and its Task Force. It was a fortuitous moment and quite precious. British Pacific Fleet Memorial Panel at Okinawa Peace Museum.